Preflop Planning is an excellent guide on how to think before the flop when deciding whether to fold, call or raise based on your position and starting hand. It's the perfect compliment to this article. Before the flop is where it all starts, where you are forced to make your first important decision depending on all of the variables involved with the hand. It is important to make good, solid decisions before the flop, as it will form the foundations for how the rest of the hand will be played out. If you make a high-quality decision before the flop, you will set the tone for the rest of the hand and give yourself the best opportunity to get into a moneymaking position. However, if you make a bad decision before the flop, you may well set yourself up for a big loss by getting yourself into a sticky position or missing out on a potentially rewarding hand. Start as you mean to go on in every hand. Make quality plays at the beginning and continue throughout the rest of the hand. Therefore after you have been dealt your cards preflop, it is important to take your time to evaluate all of the different variables in the hand, and not just make decisions on the cards that you are holding. It is important to consider your position and the type of opponents you are playing against, as well as know the correct starting hand requirements. So make sure you think very carefully before every flop and build the foundations for a profitable hand by making the correct preflop strategy decision. These particular combinations of cards have the best chances of winning than other cards, so if you stick to these you will find yourself in more profitable situations after the flop. It is possible to play other combinations of cards successfully, but if you are a beginner player then it is advised to stick with the big cards until you find your feet at the poker table. Your position in the hand is an incredibly important variable that you should be aware of in every hand, yet it is something that is all too often forgotten about. The dynamics of play are slightly different in the preflop betting round, as the small and big blind will be last to act, whereas they will be the first to act on every other betting round. However, the general principles of position will remain the same, as you want to try and play more hands where you have position over your opponents than in positions where you do not. This means that you should avoid playing too many hands in the blinds or in an early position, as being one of the first to act in each hand can make things very difficult unless you are holding a premium hand. Be very careful when playing in the blinds, and don’t feel as though you have to enter more pots in these positions because you have already committed money to the pot. It is far safer to let marginal hands go rather than to call raises with half a holding and play out of position for the rest of the hand. Your position can often play a more influential role than the strength of the cards that players are actually holding, so try and keeping the upper hand by combining good position with good cards. The cards listed above in the starting hands selection section can be played from almost any position, but you should try and tighten up your starting hand selection in the earlier positions. So as a general rule, you can play with a wider range of the top starting hands in later positions than you should in the earlier positions in the hand. When the action reaches you before the flop, you will be faced with the decision to either fold, call or raise. If there has been no raise before you, then a call will simply mean matching the size of the big blind, which is also known as ‘limping in’. This is generally not a good play, as if you are entering any pot in Holdem you will want to be making a raise and show aggression. The majority of the time you should either "pump it" or "dump it". Avoid limping in by simply calling the big blind. If you decide that you are going to enter the pot, you should be looking to make a raise of about 3 or 4 times the size of the big blind. By making a minimum raise you are letting opponents with marginal hands come in cheaply, and you are almost defeating the object of making a preflop raise. The idea of a preflop raise is to reduce the amount of players who follow you to see a flop, as it is easier to make profitable decisions when there are fewer players in the pot. So make sure to come in with a strong 3 or 4 BB raise, and increase the size of the raise if you find that a lot of players are still calling these raises with marginal hands or if other players have limped in before you. If there has been a raise before you, you must now consider whether you should fold, call or raise. If you have a poor or marginal starting hand you should look to fold. If you have a good starting hand like the ones mentioned above you should be happy to call and see a flop. If you have one of the top starting hands like AA or KK, should re-raise to help try and get as much money into the pot as possible. There will be a few cases where limping-in will be an acceptable play. This will normally be when there have been a number of other players limping-in before you, and so you will have better odds to see a flop. The best hands to limp in with are strong drawing hands such as suited cards with an ace or king, or any connecting cards that can make a straight. You are not looking to make top pair in these limped multi-way pots, as they can often land you in trouble. So aim to play hands that can land you a very strong holding or a strong draw, and then comfortably fold on the flop if neither of these materialize. If you are playing in a shorthanded game such as a 6-max table, you can afford to reduce your starting hand requirements so that you can see more flops. If you stick to the starting hand requirements mentioned above, you would probably find that you are folding too often and missing out on opportunities to win money. So you can afford to play other hands such as AT, KJ, KT, QJ and so on. When making your decision pre flop, you should also consider the type of players who you are playing against. If you notice that a tight player has made a raise, it is likely that they have a very strong hand, so you should re-evaluate the strength of your cards in this hand. Similarly, if a loose player makes a raise, it is more likely to be profitable to be call with a decent hand as you could well be holding a stronger hand than them. 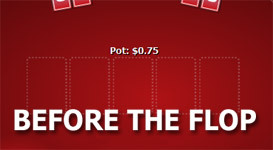 It is important to not be afraid about making bets or raises before the flop. It is important to be aggressive in poker, as it is a winning style that all good players adopt. If you are afraid to make bets and raises when you should be, then you will be making unprofitable decisions and you will find it hard to ever win money from the game. To help accustom yourself to being aggressive, you could try dropping down in limits where there is less money at stake, so that you can become comfortable with playing aggressively and notice the advantages of an aggressive style over a weak playing style.